Yarmouth Cares About Neighbors is supporting an Aging In Place (AIP) initiative in Yarmouth, led by Leigh Kirchner with support from a large group of volunteers. We interpret Aging In Place to mean: the ability to live in one’s home and community safely, independently, and comfortably regardless of age, income, or ability level. The AIP initiative received a block grant to conduct a survey of needs in Yarmouth, and used the survey results to produce a plan for services that support seniors who wish to remain in their homes. Click here to view the final plan, and you may also click here for statistical information about seniors in Yarmouth, Maine. 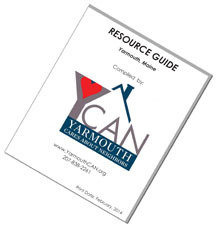 Yarmouth Aging In Place produces a quarterly newsletter, and you may read the most recent edition by clicking here. To read earlier issues, please see below. If you have questions about, or suggestions for needed services, or would like to participate, please call Leigh at 207-712-7244 or e-mail her: leighmk2050@gmail.com. The Transportation Resources Pamphlet lists all options available. Rides are available to movies at Merrill Library, YCS field trips, as well as other destinations. See the Rides Program for more information. More drivers are always welcome. Please see Donate Time for more information. If you are not able to remove snow from your property during the winter, and would like some help from a volunteer Snow Shoveler, please contact Cynthia Foss at cynthiafoss@gmail.com. We have many volunteers who help with things like a therapy dog visits, gardening help, dog walking support, etc. – however, we always welcome additional help with such things. If you enjoy helping others (no matter what age you are) please let us know if you can help with either a one-time or an on-going request.